February is the month in which you know whether you’ve kept up with what you’ve resolved, need to improve, or have failed miserably. I’m confident that a lot of woodworkers have intentions of being cleaner around the shop in the new year. We could sweep more, we could pick up cutoffs and other trip hazards as we create them, we could store the things that we use infrequently, and better organize the things we leave out. Some of you might be like me, and have tools that you no longer (or never did) use. Take my first Skilsaw. It runs, but the bushings (I doubt it has bearings) seize on the armature and it howls when it spins. I might be able to send it somewhere to be rebuilt, but how would I justify the cost and effort? I have a TS75, and a newer Skilsaw. Still, I can’t seem to let it go. I bought it at the Keesler Air Force Base Exchange in the 1970s and, if I remember correctly, paid less than $25. With the exception of the TS75, this is still the best circular saw I’ve ever had. Not for sale. 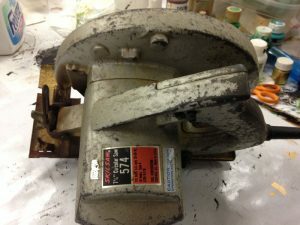 If I could solve the seizing problem, it would still be my go-to all-around circular saw. It would beat the pants off the Skilsaw I bought in 2005. 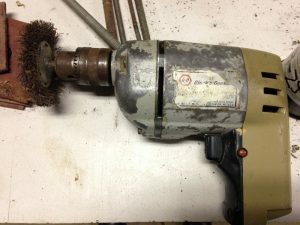 Speaking of the BX, I have a Black and Decker one-speed, one-direction (neither reversible nor variable speed had been invented yet, I don’t think) drill that I paid just $8 for, also in the 70s. It still runs as well as it ever did. Well, maybe a little noisier. I’ll probably keep it if it ever dies. It holds some really good memories. This is one tough drill. It came with a 1/4″ chuck, but I exchanged it for a 3/8″ chuck from a dead drill. Not for sale. I have an Osborne Excalibur miter gauge that I’ve never used. Heck, it’s never even been out of the box. I won it in a contest and I already had a nice Incra miter gauge that I’ve always been happy with. Somebody could have been using this fine miter gauge for all the years it’s been sitting in my office. I’d like to sell it, but I’m not sure where to start. 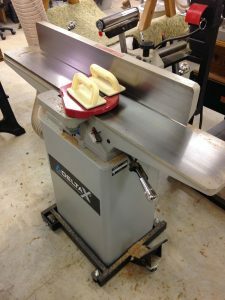 I’d like to have a bigger jointer than the 6″ Delta that I have, but what would I ever do with the old Delta? It would be cost-prohibitive to ship, but I could deliver it if I sold it locally. Sometimes a 6″ jointer is all you need, other times, it’s just not enough. Still, no one needs two jointers. Or does he? I’ve also been torn about miter saws. I took the plunge into a Festool Kapex, for a variety of reasons, but I’m still attached to my DeWalt. It’s not a sin to have two miter saws, is it? 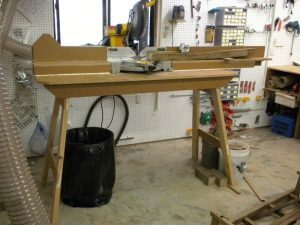 There’s nothing wrong with the DeWalt miter saw, and the Norm Abram stand is the cat’s meow. But, does one need two power miter boxes? I doubt it. Whenever I find myself deciding to keep a tool that I paid $20 for thirty years ago, then I watch about two episodes of “Hoarders” on TV and then I am able to dispose of junk like that. In fact, I had some driveway repairs done recently and they set a big dumpster in the end of the drive for a few weeks. It was a real joy to be able to toss thirty years of junk in that thing. On second thought, you may need more than a couple of episodes of “Hoarders”. I’m thinking about four should do you with a fill-in every few months to keep from relapsing. Good luck to your wife. A tool that’s no longer serviceable is junked. If and when I can bring myself to do the dread deed I’d like to give to the benefit of an upcoming younger person whom I could trust to use the tool(s) wisely and most importantly keep them in good condition. Sadly not a case that has happened in the past so far. Abuse of tools, used or stored, hurts to the core. It’s a disease you know. We just had an experience with some friends of ours. Their mother and dad had a sort of Hoarders Bug, The two older people let the younger set sell off “old use inventory”. They did sell. They sold many duplicates of stuff like power saws and drills and vises, “oh my”. They sold variations of stuff from years of collecting bolts, screws, nails and unrecognizable other stuff. This selling frenzy went on for a couple of weeks. Other people will buy your stuff if the mark-up is inexpensive – or cheep ( has the patina of age). They ended up selling much of it but there were no stories of profiteering. There were some bleary-eyed accounts of said inventory propagating itself in some manner because of closeness issues. The warning to older parents is “what you think is junk is junk, and you did not want it anyway, way back when it wasn’t. I’ve had good luck selling no-longer-used tools on Ebay. Those too big for UPS I have sold via the message board on the Woodworkers’ Guild of Georgia website or (in the old days) the bulletin board at Highland. For things nobody seems to want, and for scrap wood that threatens to bury me, freecycle.org has never failed to connect me almost instantly with somebody willing to come haul it away for free. Never buy cheap tools. Never throw out good tools. When you run out of room, build a bigger shed. You can NEVER have too many good tools. Oh, and always buy a sympathetic wife. If she’s not sympathetic, you didn’t pay enough!